"Today is the day, whether we win or lose, everything will be over." ADV brings us the fourth and final disc in the Blue Seed saga, where we get to determine whether it can come to a satisfying conclusion. This disc contains another six episodes which play out the last story arc, and as has been the case so far, I was extremely captivated by this interesting anime. While the story has been great so far, what is even more interesting is its foundations in Japanese mythology, which are laid out in the Records of Ancient Matters, the Kojiki. First are characters of Kaede and Momiji, based on the legend of Princess Kushinada, the last of eight daughters of Ashinadzuchi, and Susano-oh, the god of storms and the sea, who is banished to Earth. In exchange for his marriage to Princess Kushinada, Susano-oh slays the eight-headed dragon Orochi, who had been ritually devouring the princess' sisters for the past seven years. Kusanagi's name is derived from that of the magical sword found in Orochi's tail, who in Blue Seed becomes the guardian of the Kushinada, whose sacrifice would end the existence of the monster race of Aragami, also based on Japanese legend. The mitama, which are also central to Blue Seed, are based on the Shinto religion's kami, which are the spirits which inhabit all things. The mitama are a basis of power for Kusanagi, his nemesis Murakamo, the Aragami, and for Susano-oh, and are the Blue Seeds referred to by the title. The showdown that will decide the fate of Japan is drawing nigh. As Momiji struggles with her place in these events, Kusanagi faces down Murakamo, whose dreams of returning the Aragami to Japan rest on the final ceremony between Kaede and Susano-oh. Kaede intends to revert all of Japan to a nation of plants, where it can be reborn in the tradition of the old ways. With Japan covered in strange new vegetation, the government reveals that the only way to stop the threat is the sacrifice of Momiji, which causes the TAC force to go underground in an effort to save her, while they try to determine a way to defeat the Susano-oh and the Aragami. Their mission is to locate and defend the shrine that will be used in the last ritual, and prevent it from taking place. With the world on alert over the coming events, can Japan be saved? While much of the first three discs were comprised of an Aragami of the week, these final episodes form a more united collection, with the purposes of each character being fully exposed, and the events unravelling the destiny of all involved. The twists and turns, and the revelations uncovered, make for another entertaining set, with lots of action, and very little filler. The relationships all get a bit more depth, and the agendas of all parties are called into question. I am again impressed by the gorgeous background artwork, and by the voice actors who bring life to the characters. The story continued to hold my interest, and the resolution was exciting and satisfying. Digging deeper into the characters and story, I am also impressed by the historical and thematic ties the series uses, from the mythology and names of the Aragami with their origin in Japanese legend, to the names of the TAC team themselves, which correspond to the colors of their uniforms, and plants of similar coloration. Fun, exciting and riddled with detail, I have no qualms about adding this to my list of recommendations�Blue Seed delivers the goods. Image Transfer Review: Only minor quibbles with this one. Colors are vibrant, black levels solid, and only minimal compression issues in a few areas. Dark blues continue to suffer the most, with a grain presence that is otherwise unnoticeable. A few shimmers here and there. Background art is rendered beautifully for an overall excellent presentation. Audio Transfer Review: Japanese audio continues to maintain effective use of the stereo soundstage, with a decent amount of ambience to enhance the presentation. No technical deficiencies to report on this one. English and Spanish dubs are also available. Extras Review: The Omake theaters have been the central extra on each Blue Seed disc, and the fourth in the series doesn't disappoint with another four wacky offshoots. In Susano-oh, Oh, No!, the young god learns what cause and effect means, as throwing a pebble into the ocean escalates into a battle of monstrous proportions. Next, we get an exciting preview of Blue Seed: The Movie�sort of. Here's one I hoped I'd never see, with Momiji's grandmother at center stage and fan service for the elderly, in Grandma Go Go!. Finally, in an alternate version of the first omake theater The Man Who Watches the Kushinada, Kusanagi and Daitetsu's true selves are exposed in Mamoru Kusanagi's Biography�just follow the bouncing dot, and see what the girls have to say this time. The final Blue Seed Saga overview is included, along with character bios for Sakura, Azusa and Shunichi. Another six preview trailers are included: Samurai X,Sorcerer Hunters, Gasaraki Gunsmith Cats, Dirty Pair Flash, and Generator Gawl. 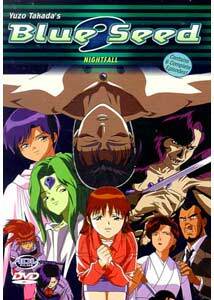 The fourth and final disc in the Blue Seed saga concludes the series with six more episodes. I have thoroughly enjoyed the show, and with all 26 episodes plus the 13 omake theaters being included in only four discs, this is excellent value as well. Soaked in humour, drenched in historical and mythological background, brimming with action and with a fluid pace, Blue Seed takes its place amongst my favorites.